Omaha Pneumatic is a family owned business, and we make sure that fact exudes throughout the company. Omaha Pneumatic is a family owned business, and we make sure that fact exudes throughout the company. We are a family, but we are a family that has the great potential and desire to grow. We are constantly looking for self-motivated, professional, dedicated and prideful individuals to join our team. We will train you to be the best you can be and reach your full potential in every way. If you are looking for a career, and not just another monotonous job, please, apply here today! For 30+ years, Omaha Pneumatic Equipment Company has been the region’s leading industrial services company serving the manufacturing and process industries with both equipment and service. This includes compressed air, vacuum, air and energy monitoring, piping and lubing equipment, used equipment rental and sales, and 24/7 service. 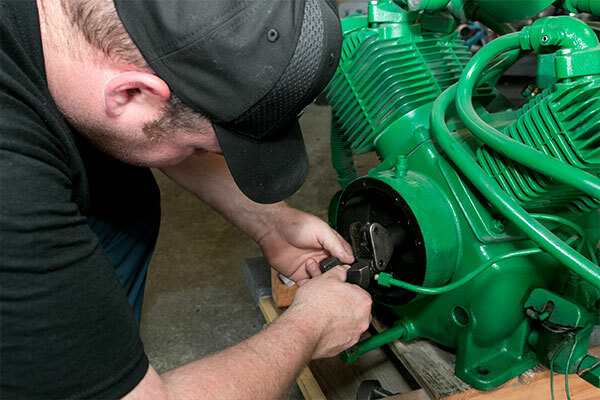 We continue to grow and need additional full-time air compressor service technicians. We currently have opportunities for field-service technicians, who want to succeed in a long-term career with us. We are based in Omaha, Nebraska. This position blends your electrical and mechanical aptitudes, so if you believe you have superior troubleshooting talent, accurate record keeping habits, are organized with disciplined work habits, have moderate to good computer proficiency, and practice good interpersonal communication skills, we’d love to hear from you. Qualified Veterans encouraged to apply. You will eventually be able to work with all top-tier brands of compressors including Mattei, Boge, Atlas Copco and FS Curtis.